Usually when I make soup, I make it for at least 5 other people. This recipe is one large enough for 10-14 people, or for leftovers for the week! 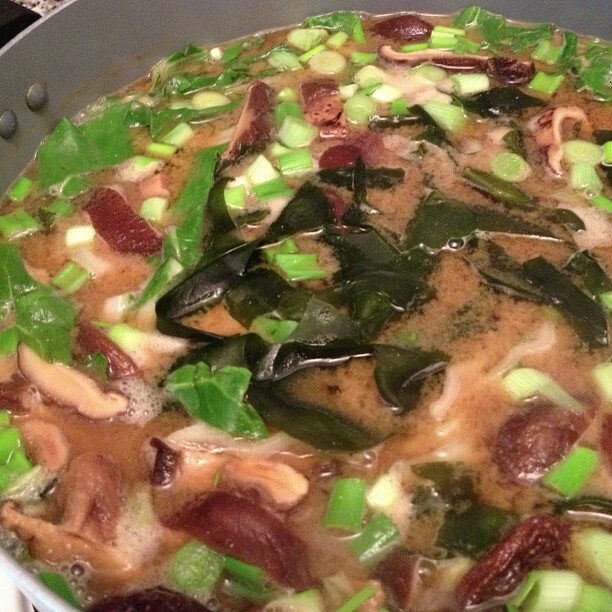 In a large bowl put dried wakame and shitake mushrooms. Cover them with boiling water. Let them sit in the water for an hour, to re-hydrate. Then rinse off, multiple times, to remove some of the ocean flavor. Remove the stems from the mushrooms and slice them. In a large pot bring the miso and water to a boil. Whisk together. Add remaining ingredients to the pot. Let everything simmer for 45 minutes. Enjoy!